Weighty Matters: Paula Deen has Diabetes and takes Victoza. So What? Paula Deen has Diabetes and takes Victoza. So What? I've been kicking this story around in my head since it came out. 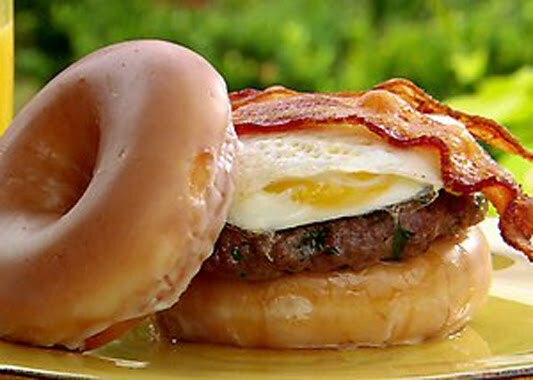 Celebrity TV chef with obesity who makes repulsively, insanely, calorificly obscene foods (like the bacon, fried egg, doughnut burger of hers pictured up above) develops type II diabetes, doesn't tell anyone for 3 years, and then not only has a big reveal, but signs a deal to endorse an injectable hypoglycemic medication. Certainly the blogosphere's abuzz with outrage over the irony, the hypocrisy and the message being sent, and while I agree it's ironic, nutritionally hypocritical and a rather sad message, try as I might, the furthest I get is plain disappointed - I just can't work up any consternation. Sure, the food she promotes (and presumably eats) is ridiculously decadent calorically and not what any would describe as healthful. Sure eating that sort of food on a regular basis would likely lead you to weight gain which in turn will put you at a much higher risk of diabetes. Sure the message of, "don't worry about your diabetes, there's a drug for that, so keep eating whatever you want" isn't exactly a healthy one. But I'm still confused as to why people are so up in arms. What I mean is, Paula's not an allied health professional, she's a TV chef with diabetes who cooks far from healthy fare, who apparently now takes Victoza, who frankly was never even remotely seen as a healthy living role model even before her diabetes diagnosis. Did people really look to her or her meals and think she or they were such a picture of health that on that basis they increased the frequency with which they actually prepared her recipes? We all accept differing degrees of risk into our lives. Jaywalking, biking without a helmet, driving short distances without a seatbelt, smoking, drinking, drugs, processed meats, trans-fats, improper weight lifting techniques, avoiding the doctor, not taking our medications, etc. The fact that Paula wants to continue to risk her health by presumably continuing to eat her bacon fried mac and cheese? That's her business, and were she explicitly telling people her extravagances were healthy, it would certainly be horribly hypocritical, but that's not how she sold them or herself. Consequently I don't think she or her show are any more or less reprehensible now than before her diagnosis. I guess really what I'm getting at is that I don't for one millisecond believe that the reason people so regularly eat terrible diets is because Paula Deen cooks appalling food on her show. That'd be giving Paula way too much credit. So could good come from Paula's diagnosis and drug deal? What if her diagnosis inspired people who were already eating horrible Paula Deen'esque diets to go to their doctors to get checked for diabetes, or if they already have diabetes, go and ask about whether or not Victoza would be suitable for them? Great I say. If her being a spokesperson for Victoza leads to improved secondary prevention of type 2 diabetic complications then bully for her, and who knows, some people with newly Paula Deen inspired diagnoses may even elect, unlike apparently Paula, to make marked lifestyle changes. Yes, it'd be lovely if we all ate exceedingly healthful diets, yes it'd be great if we all exercised regularly, and yes it'd be great if we rarely if ever cooked any of Paula Deen's ludicrous concoctions. But that's not everyone's world, and for those already living in Paula's, becoming more aware of type 2 diabetes and its treatments is probably a good thing. Could Paula have taken this opportunity to become a healthy role model for America? Yes. Did she? Clearly not, and while I would have hoped that as a human being she would have seen value in that, her obvious refusal to step up to that plate leaves her playing the same role she always has - a B list celebrity chef whose claim to fame is cooking nutritionally repugnant food. Too bad she didn't trade up and become someone laudable.